Carousel Slideshow (formerly known as All Visual Boston) put on its fourth slideshow this past Thursday night at Spontaneous Celebrations in Jamaica Plain. Trevor Powers organized the first slideshow a few years ago as a spinoff of All Visual LA and when he moved to Texas, Aviary Gallery decided to carry on the tradition. Different from a traditional photo exhibition, Carousel is a one night event that brings artists together, not only to take in some stunning photography, but also to network and discover new artistic connections. Since Carousel is digitally projected, the featured artists don’t need to pay to print or frame their work, a welcome reprieve from the expenses of displaying artwork. It also offers a chance for artists to show work that might be so new it hasn’t yet found its way into print form. 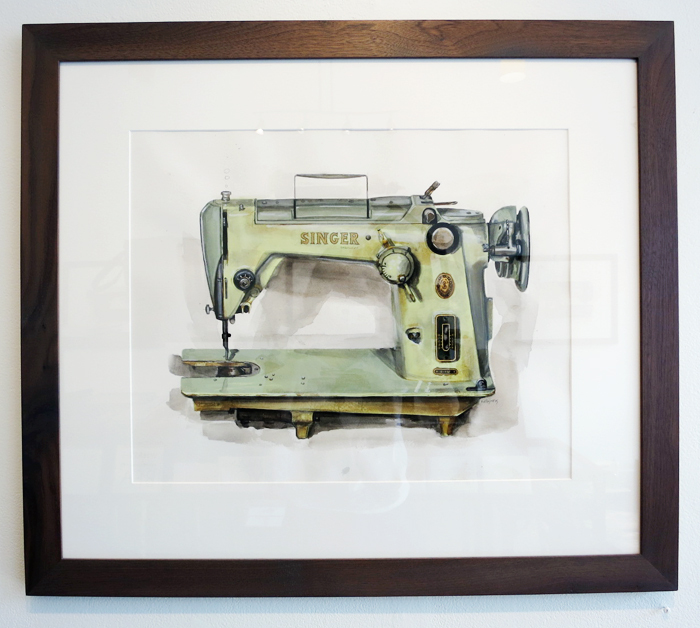 “Katie James: Sewing Machines” features all new paintings by Katie James of vintage sewing machines. Done in gouache and pencil on paper, each painting is incredibly precise and photorealistic without losing the charm and personality of a handmade work. James’ writes in her artist statement, “I sit in down in front of something better made and more functional than you could possibly get today, and just try to do it justice.” She artfully balances form and function, memorializing an era, while creating artwork that is still very fresh and new. James’ sewing machine subjects are displayed along with the paintings in the gallery. Not paired directly beneath, but scattered about the gallery tables and in the front window, the machines feel at home in the Aviary’s comfortable setting. Even when inspected side-by-side neither the machine nor the painting diminishes – each stands alone as an art object and enter into conversation when viewed together. James is selling the each painting with the sewing machine it’s of as a *very reasonably priced* pair. 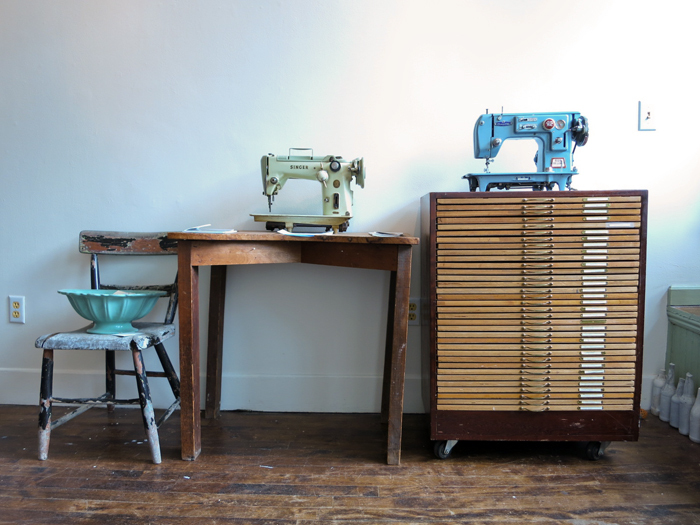 “Katie James: Sewing Machines” is only up at the Aviary Gallery until July 28th, so hurry over before the show comes down! See More of Katie James’ work here. Learn more about the Aviary Gallery here. !Revolución! IBA’s 45 Years of Victory! 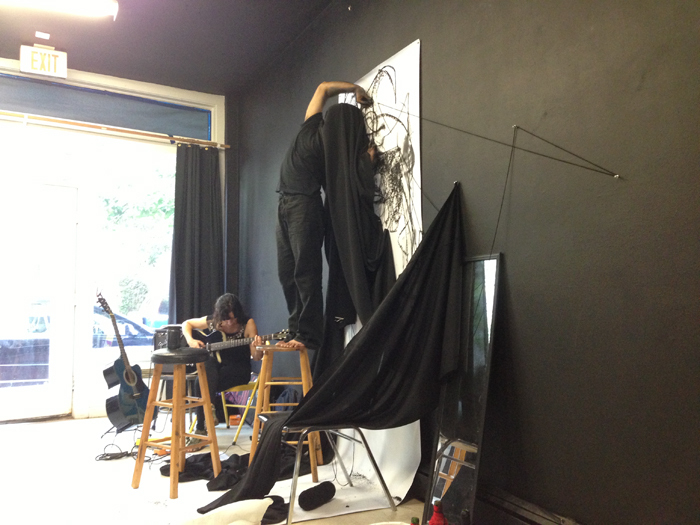 Mobius hosted a unique performance and drawing event this Sunday from 12-5. I Arrived around 2, so I missed the first performer, El Putnam, therefore my writeup will focus on Performance Artist, Syed Zaman, who performed “Love is Black” with Singer/Songwriter, Jennifer Matthews. Mobius is a small venue, so the performance was intimate, with less than ten audience members. 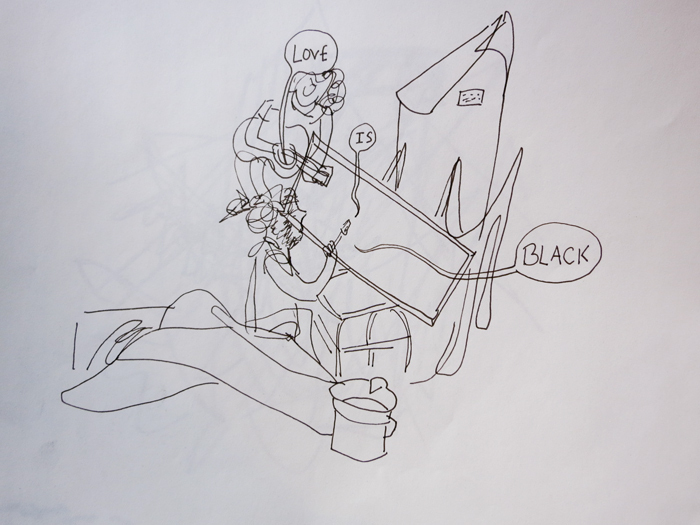 Viewers were encouraged to create drawings in response to the performance in progress. I’m used to simply observing or taking photos of performances, which always seems to require a slight, if momentary, mental and physical distancing from the performance to raise the camera and take the photo. 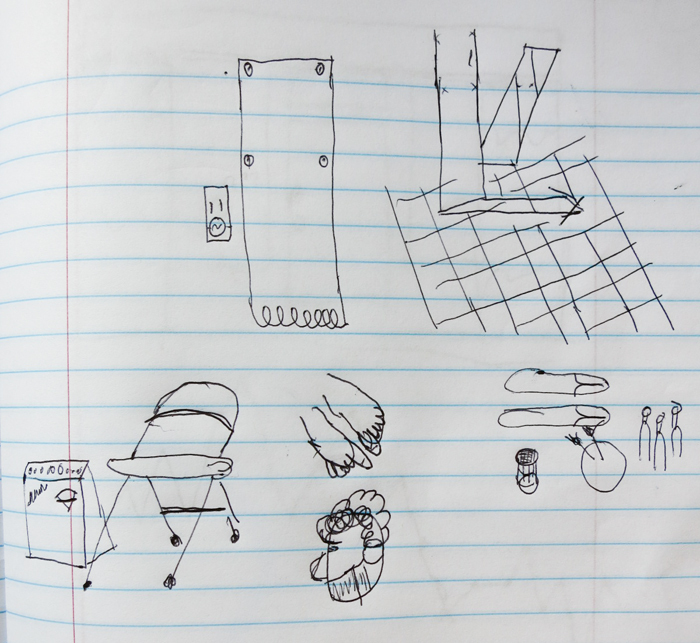 Drawing in response to the performance on the other hand proved to be engaging through allowing viewers to express their responses to the action rather simply trying to document. The performance began even while Zaman and Matthews were still setting up for the “official” performance – as each new item was added to and rearranged in the performance space, it became a part of the catalogue of physical elements that would shape the coming performance. 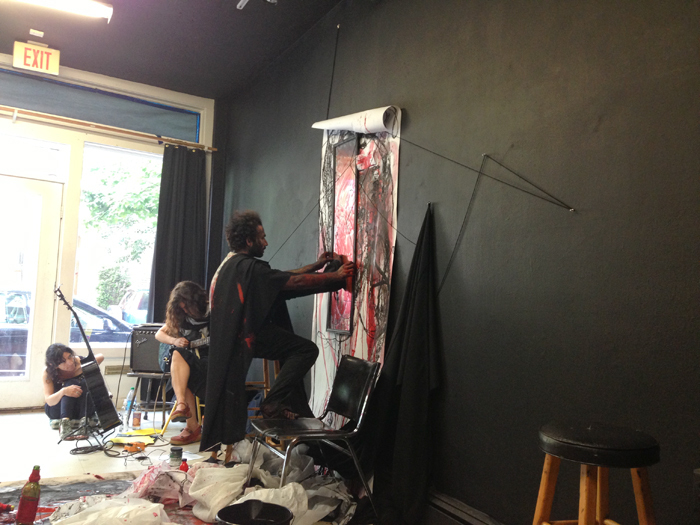 The performance officially began as Matthews began to play her guitar and Zaman climbed on a chair, wrapped himself in black fabric, and began to make charcoal marks on the paper tacked to the wall and floor. As Zaman bent and twisted his body, creating an ever shifting net of cloth and string and charcoal, Matthews wove her voice into the web. Together they used shifts of musical motif and artistic media to create a flow of vignettes exploring the color and feeling of love. 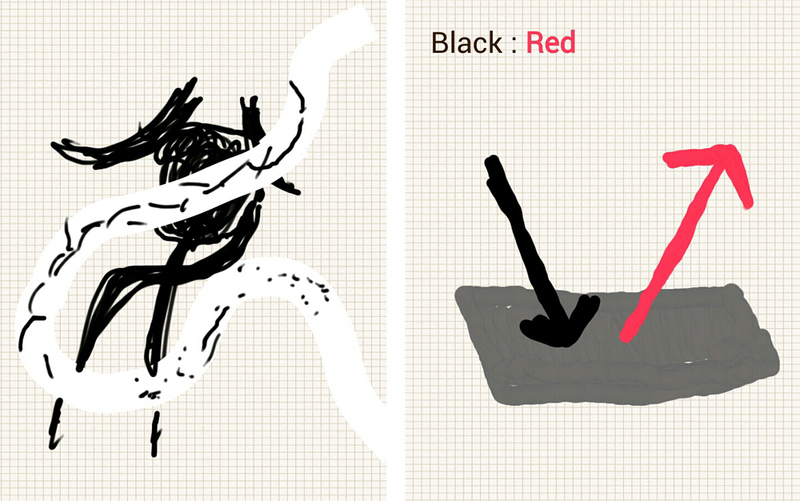 Black string became black cloth, became charcoal, became black paint, became red tissue paper, became red ink, became red string. and finally re-formed into a representative moment. 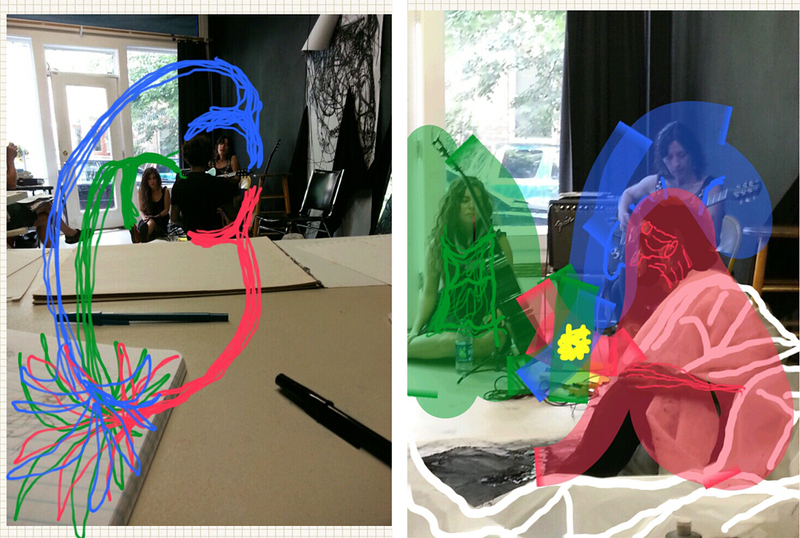 A challenge, a way to focus, a fun afternoon – I highly recommend that you all try drawing to performance art ASAP. More about Performing on Paper here. 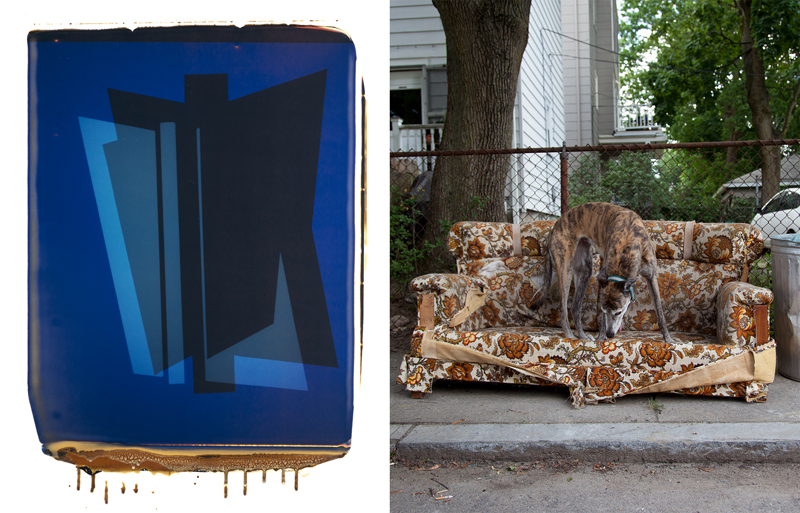 When: Reception Thursday July 11, 4-6pm, Artist Talk 4:30pm, Show up 7/8 – 7/12. 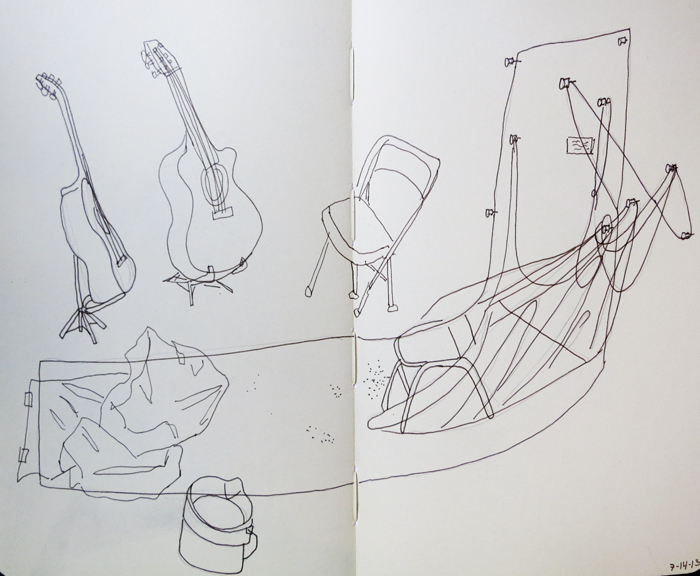 A unique way to draw: to respond to live performance art. Draw the whole time or come and go as you wish. A few of Cobi Moules’ self-portraits were hanging up in the back gallery the first time I ever visited Carroll and Sons and I was very happy to see Moules’ work there again, this time filling the main gallery. The show winds together four different projects. Most immediately striking are the slightly larger than life self-portraits that Moules has been painting periodically since 2009. 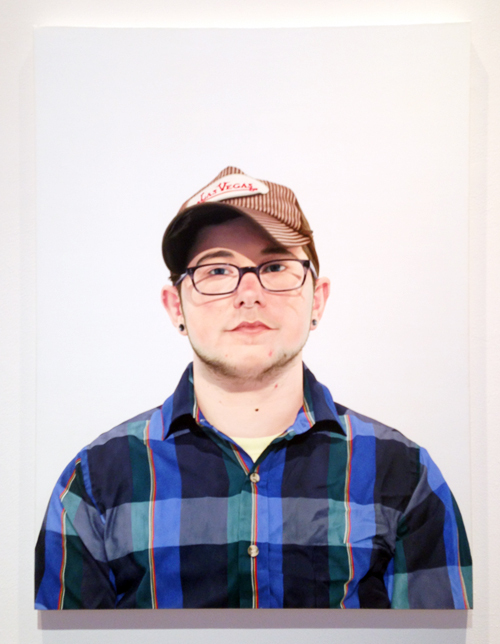 The self-portraits create a visual chronicle, most directly of his gender transition, but also of his painting style and maturity. Interwoven with the 30″x40″ portraits are smaller canvases on which Moules has created sylvan tableaus featuring a cast of Cobi clones. 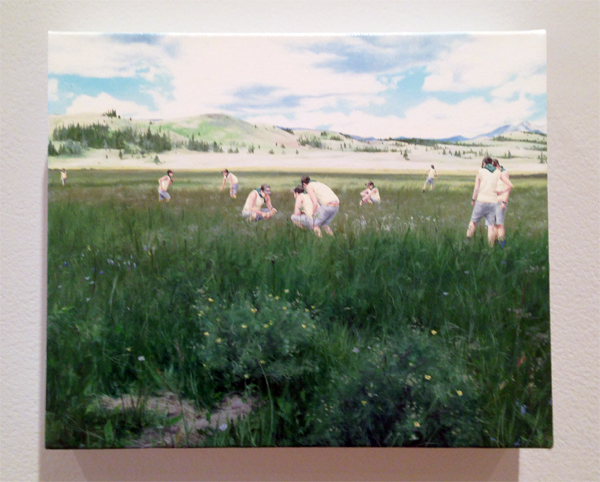 The picturesque but surreal images recall Anthony Goicolea’s photo composite scenes of himself roleplaying adolescent queer narratives, but Moules carefully paints where Goicolea Photoshops and the scenes are less obviously queer, focusing more on a communal exploration of nature. 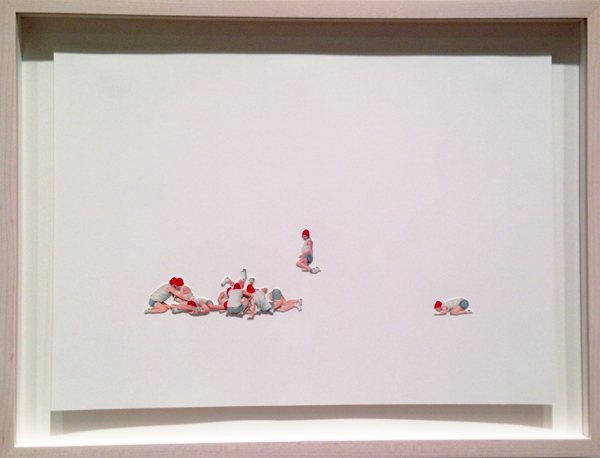 Shrinking even further, Moules abstracts his painted selves from nature and lets the tiny figures tumble together, collaged onto a blank paper void. Moules’ show combines pristine painting technique with rich exploration of self-identity and engages the viewer in the process of carefully inspecting each painting. Moules invites the viewer to look for subtle differences between many versions of the same person, but leaves the question open as to what the many divisions of self add up to. I look forward to more work from Moules in the years to come. The ever-engaging Anthony Greaney featured duel performances by Phil Fryer and Tom Maio going on throughout the evening on Friday. 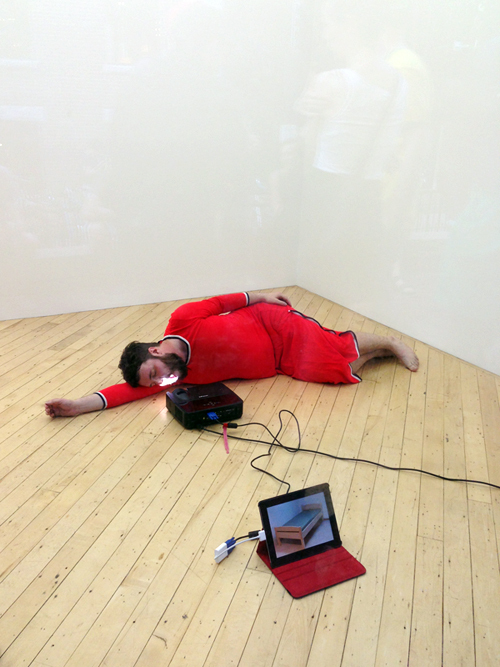 I missed Maio, but caught Fryer’s Patriotic themed performance, involving a red dress, blue and red paint, a keyboard, and a projection of a bed. 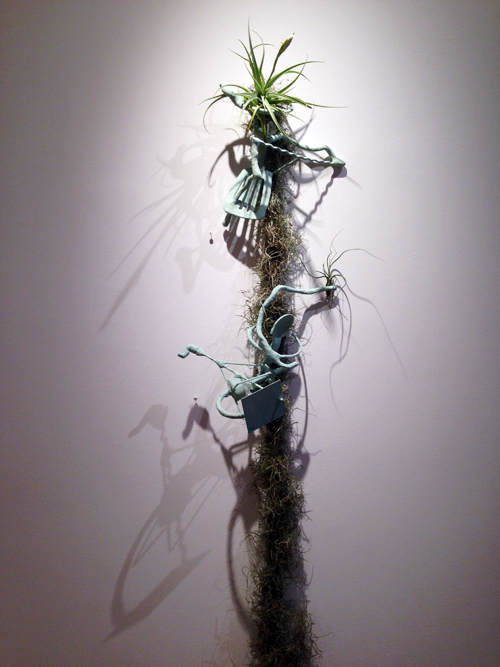 Brown’s installation transforms Kingston Gallery into a forest sculpture, strings of moss linking together twisting metal towers. I enjoyed ducking in amongst the different sections to inspect the pale green sculptures that almost resolve into recognizable forms before the resemblance dissolves. 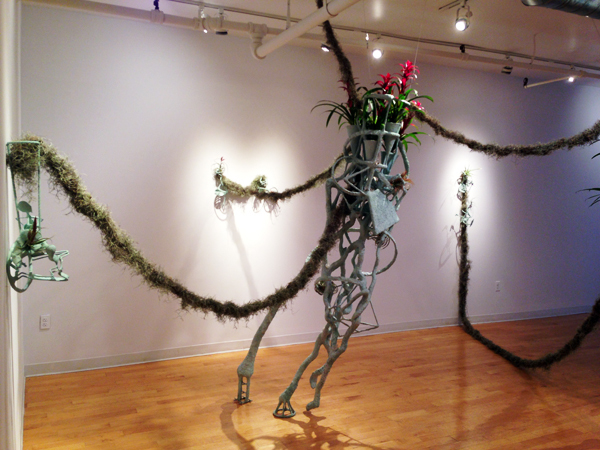 Location: Anthony Greaney Gallery, 450 Harrison Ave., No. 1, Boston, MA.